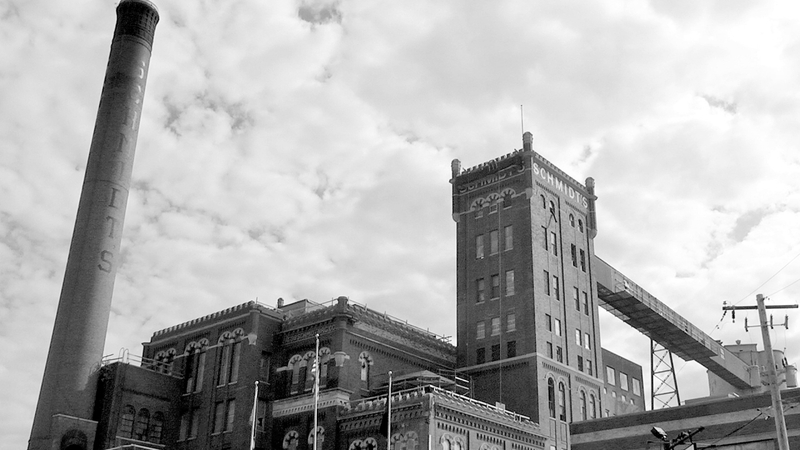 The Schmidt Brewery has been a fixture in Saint Paul’s West 7th neighborhood since 1855. Well, actually, back then it was called Cave Brewery—named for the natural cave used as a cool and dry spot for brewing beer. The brewery became the largest in Minnesota by 1860, producing 1,200 barrels annually and shipping them as far south as Tennessee. It was restructured as the St. Paul Brewing Company in 1898 before being sold to Jacob Schmidt soon after in 1900. When prohibition shut down most of the breweries in the 1920s, the Schmidt Brewery kept afloat by making non-alcoholic beverages like Malta and City Club. Prohibition was lifted in 1933 and Schmidt’s became the 7th largest brewery in the country by 1936. Schmidt Brewery changed hands a number of times between 1954 and 1987 before ceasing production in 1990. The Minnesota Brewing Company bought the space in 1991 and started brewing the not very successful Landmark Beer (named for, you guessed it—or maybe you didn’t—Saint Paul’s iconic downtown Landmark Center). The brewery shut down for good in 2002 and shifted gears to produce ethanol for Gopher State until the doors closed again in 2004. The bottle and brew houses were converted in 2012 into the Schmidt Artist Lofts, and the former keg house will now house the aptly named Keg and Case Market. Learn more about Saint Paul's beer history.